Of all the fish that swim in our coastal waters, probably the best known is the cod. From its breeding grounds near Iceland it migrates south to feed in the seas around the British Isles. The cod is greeny-brown or olive-grey in colour and with its huge mouth it has a reputation for being a greedy feeder. Cod can grow to be huge specimens and fish of more than 20 kgs have been landed using rod and line. Smaller cod which are caught more frequently are known as codling. Cod can be caught from beaches, piers, harbours, rocks, boats and in estuaries. In northern waters, especially Scotland, cod are present throughout the year. In southern coastal areas winter is the best time for catching cod. As the angler becomes more experienced so the equipment becomes more sophisticated. For instance, a shore angler will use a long beach-caster rod and a specialist multiplier reel in order to cast the bait great distances. For the novice angler the tackle does not have to be too complicated and so therefore will be less expensive. Choose a rod that is not too long, about three metres will be fine. A rod this size will be adequate for fishing from shore, pier, jetty and boat. The best reel to start with is called a fixed spool reel. It is the same type as used by freshwater anglers but, of course, the line on the reel needs to be much stronger. Cod are bottom feeding fish, scavenging far below the surface so on the end of the line there needs to be a heavy weight to keep the bait deep in the water. To experience cod fishing for the first time try boat fishing. At most harbours and holiday resorts fishing trips are available. 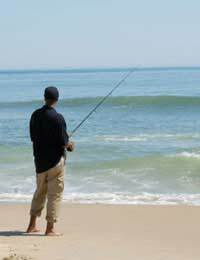 Tackle and bait are usually provided and it is an opportunity to discover what sea fishing is all about. The skippers of the boats will offer good advice and help with any tackle problems. They will also sail to marks where fish are located. Skippers need future customers so it’s in their interest to help you catch fish. Peeler crab is highly recommended bait for cod. They get their name from the habit of shedding or peeling their skin during various stages of growth. Peeler crab can be found at low tide especially in estuaries. Lugworm and ragworm are very popular bait. They can be bought at tackle shops but can be expensive and sometimes stale. Take a bucket and a garden fork and stroll along the beach at low tide. In the wet sand look out for worm casts and blow holes and dig up fresh, free bait. Be careful if you come across a king ragworm. It resembles a large centipede and can reach lengths of up to 60 cms. However, it has retractable pincers in its mouth and can inflict a painful bite! Mackerel can be bought readily at fishmongers or on a quayside. They are a great bait for cod because they are an oily fish and when cut into strips and put on the hook they give off an odour to attract any passing predator.